This presentation will be based on Dr. Simon Balto’s research that explores the development of a police system in Chicago’s Black neighborhoods that over the course of the mid-twentieth century became simultaneously brutally repressive and neglectful. 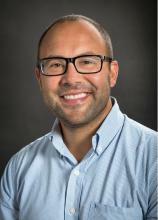 Dr. Simon Balto teaches, researches, and writes about African American history in the United States. His first book, Occupied Territory: Policing Black Chicago from Red Summer to Black Power (University of North Carolina Press, 2019), explores the development of a police system in Chicago’s Black neighborhoods that over the course of the mid-twentieth century became simultaneously brutally repressive and neglectful. His writing has also appeared in TIME magazine, The Washington Post, The Progressive, the Journal of African American History, Labor, and numerous other popular and scholarly outlets. Professor Balto earned his Ph.D. in History from the University of Wisconsin in 2015, where he also earned a Master’s Degree in African American Studies. He has been the recipient of grants and fellowships from the National Endowment for the Humanities and the Mellon Foundation, among others.